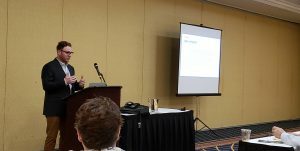 The 2019 Pennsylvania Manufactured Housing Association’s (PMHA) Industry Networking Conference and 70th Anniversary Celebration was held March 12 – 13 at the Wyndham Gettysburg. The conference, sponsored by PMHA in partnership with the Pennsylvania Propane Gas Association (PAPGA) drew a record number of attendees and exhibitors. Steven B. Wiley, President & Founder of the Lincoln Leadership Institute was the keynote speaker. Wiley’s powerful multi-media experience provided attendees an insight into leadership, followership and organizational effectiveness using history as a metaphor and the battlefields of the Gettysburg National Military Park as a classroom in leadership. Wiley was welcomed and introduced by long-time friend and PAPGA Board of Director, Dan Messett, who also chairs the PAPGA Marketing Committee. Dan Messett was the surprise recipient of the prestigious President’s Award. The winner, selected solely by the PMHA President, was revealed during the 70th Anniversary Celebration Dinner themed “Honoring Our, Past and Present, Industry Greats’. 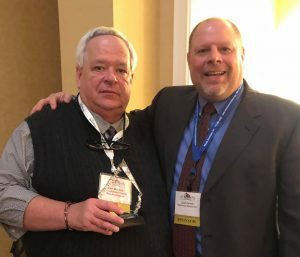 President John Fanelli announced he chose Messett for his unfaltering 20+ years of support and participation in the Association and the Pennsylvania manufactured housing industry. ‘I am honored to receive the President’s Award. I am very surprised and accept it on behalf of the past and present members of PAPGA who support and participate in the events we sponsor with PMHA. The true success of our efforts with the manufactured housing industry is our propane marketers providing the energy needs daily to the thousands of families who live in factory built housing’, said Dan Messett. provided an overview of propane and discussed the many benefits of propane usage within manufactured housing projects and construction. The next event on the PAPGA calendar is the Spring Membership/Board of Directors Meeting on April 4, 2019 at the Hershey Lodge, Hershey, PA. For more information and to register, follow this link. The Pennsylvania Propane Gas Association (PAPGA) is a member-focused trade association providing services that communicate, educate and promote the propane industry in Pennsylvania. The association was formed in 1947 to offer opportunities to learn through training and networking with peers, and to aid with legislative issues that contribute to operating a safe and successful industry. PAPGA continues to focus on education, networking and representing the interest of Pennsylvania’s propane businesses to the government, while assisting members in remaining current on topics vital to the propane industry. The Pennsylvania Propane Gas Association is affiliated with the National Propane Gas Association (NPGA), Propane Education and Research Council (PERC) and Women in Propane Council (WIP).